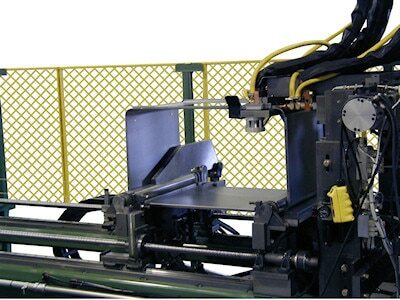 Custom Rollform Products manufactures a wide variety of Tangent Formers, Wingformers, & End Forming Units. They can be used as Free Standing Manual Feed Units or incorporated into an Inline Fabrication System to final form the part. Tangent Forming Units are designed to Wingform or Endform Sheet Metal Flanges or Housings while holding the part or panel in the horizontal flat panel position. They can be used as a Primary Free Standing Forming Unit or to operate in conjunction with a Rollforming System to Endform the leading and trailing ends and/or Final Form the part into a Full Wrapper Housing or Cabinet. 16 Ga. Stainless Steel Oven Cavity 1 ½” radius corners. Free Standing Tangent Wingformer 10 and 12 Ga.
Three (3) sided Wrapper with 6” radius corners. 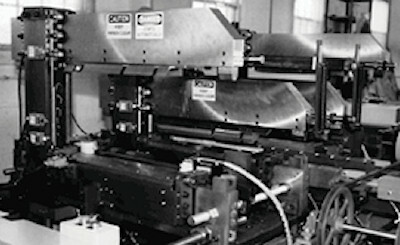 Many applications utilize a Rollformer to form the continuous linear flanges of a part and use a Tangent End Former to close the end sections. Parts like Shelving, Partitions, Drawer Bodies, and Cabinets are just a few of the products that can incorporate Tangent Forming Applications. 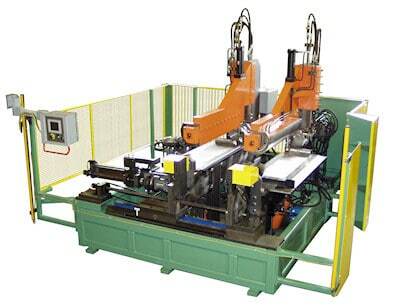 Besides Endform Operations, Tangent Forming Units can also be used to final form sections into two (2) sided, three (3) sided, or four (4) sided full wrapper cabinet sections. Items like Air Conditioners, File Cabinets, Refrigerators, or Vending Machine Cabinets can be formed in a variety of configurations. into a three (3) side furnace wrapper cabinets.